To quote from Spank's Edinburgh Diary 2005, published 29/08/2005 on the old site: "It almost makes me sad that I won't be [at Edinburgh] next year. But you know the rules: two years on, one year off, meaning that my next visit will be in 2007. I already have tentative plans for what we'll be doing as a replacement in Summer 2006. However, I don't intend to start banging the drum about those plans just yet. Being a monkey, and all." And that, ladies and gentlemen, is what you call bloody foreshadowing. I've been doing this for ten years now, since you ask. I was always aware that some sort of big movie-related event took place in this city every November, but whenever I tried to find out more I kept being told that all the tickets for the good stuff had been bought up by National Film Theatre members. 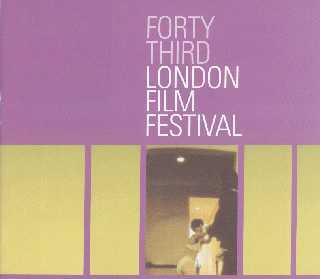 Eventually in 1989 I bit the bullet, joined the NFT, and eagerly awaited the programme for the 33rd London Film Festival. Originally posted on The Unpleasant Lair Of Spank The Monkey 20/11/1998. First in a series of reposts to get you all in the mood for the 2006 Festival, coming in October. True story. Ask around if you don't believe me. Last year's opening gala film at the London Film Festival was Keep The Aspidistra Flying, starring Richard E Grant and Helena Bonham Carter. To be perfectly frank, it wasn't terribly good: however, that isn't really the point with the Opening Gala. It's a big glossy celebrity-infested British premiere, and if you're a National Film Theatre member and fairly quick off the mark, you can be in the audience too. I was there last year with about half a dozen of Spank's Pals, and it's a tremendous feeling when you walk down that fenced-off path to the entrance to the Odeon Leicester Square, being stared at by rubbernecking tourists trying to work out if you're famous or not. From my reply to a letter dated August 3rd 2000, on the old site: "Sadly, I think my comics reading days are drawing to a close. 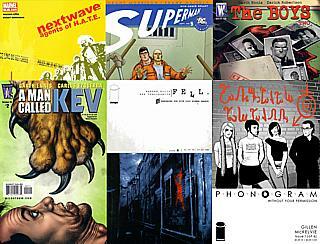 At the time when I wrote the relevant pieces, Transmetropolitan, The Invisibles and Preacher were the only three monthly books I was buying regularly: The Invisibles has finished, Preacher finishes next month, and I haven't found any permanent replacements for them yet. I'm still willing to be surprised, though." Six years later, after a couple of weeks out of the country, I hit the comic shops to catch up on the issues I've missed while I was away. And I suddenly realise what I've bought. Two comics by the writer of Transmetropolitan. One comic by the writer of The Invisibles. Two comics by the writer of Preacher. And one more by some other guy. Maybe I'm not as willing to be surprised as I thought I was. But here, since you ask, are the details of my current monthly comics shopping list. WARNING: spoilers for The Wicker Man both below and to the left. Cheers to LumberjackTwins for the video. I'm part of a particular generation of British people who all discovered The Wicker Man in exactly the same way. One Saturday night in the late seventies or early eighties, we all came home legless from the pub and turned on the telly. We stumbled into this strange little British film from 1973, featuring Edward Woodward as a straight-laced copper investigating a possible child abduction on the island of Lord Summerisle (Christopher Lee), the head of a pagan agricultural community. We watched in astonishment as things got stranger and stranger, and built to an utterly unforgettable climax. And at the end, we all made a mental note to be sure to be sober next time they showed it on TV. It's possible that a future generation may drunkenly fall in love with Neil LaBute's 2006 remake in the same way, but quite frankly there isn't enough alcohol in the world to make that scenario work. It's the first of the month, so it's time for another one of those hard-working posts that serves multiple functions: a link to a favourite monkey-related website, an open comment forum where anyone (but, it would seem, mainly Suze at the moment) can spout off about what's on their mind right now, and a quick note on site news and things to look out for in the near future.